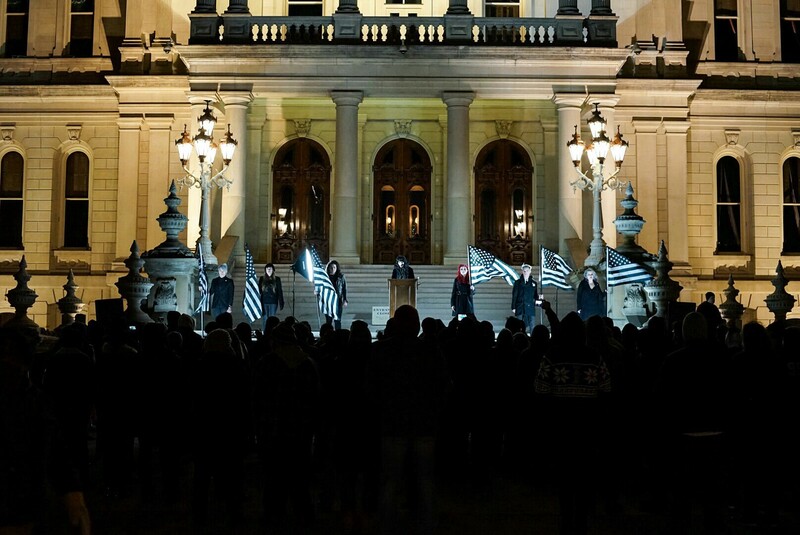 Members of The Satanic Temple of Detroit hold the nation’s first state-sanctioned Satanic ceremony on the steps of the Michigan State Capitol, 2015. It’s with a heavy heart that I pen this open letter. This past March, I left my position as spokesperson and member of The Satanic Temple (TST), an organization best known for anti-theocratic rabble rousing via litigation and occult-style public demonstrations. The organization inspired countless people who have organized their communities and found the motivation and strength to challenge injustices. I am endlessly moved by TST’s supporters and have no interest in taking these important experiences and relationships away from anyone. I have been relatively silent about my departure and I fear that this letter will create a wound for some. I assure you, my intent is not to inflict pain, but to inspire accountability. I was intimately connected to the majority of the organization’s most notable actions as a consultant and public representative for the better half of the Temple’s life. When I was invited to join the organization in 2014, I was a practicing Satanist and activist. I saw a group of engaged outsiders bringing power to their voices through radical political action. I dedicated five years to the Temple: helping it grow, developing policies and models for success, and quite literally, placing my life and livelihood on the line. As one of the few visible and prominent female voices in TST, I endured countless threats, harassment, and violations. I dedicated myself because the Temple’s mission, to “encourage benevolence and empathy among all people, reject tyrannical authority, advocate practical common sense and justice, and be directed by the human conscience to undertake noble pursuits guided by the individual will,” was one that I believed in — and still do. Within three years of my joining the organization, TST had grown exponentially. Like many groups facing unanticipated success, the Temple struggled to develop the kind of infrastructure required to evolve and support its members. We launched a chapter model, an online shop, and found ourselves up to our necks in requests from journalists and eager new members. I proposed a system of checks and balances, of developing shared leadership, and of vetting project ideas. I could have done better, and I am not blameless, but I was also not silent. It became clear to me that TST leadership was unwilling or unable to address its capacity issues and tackle head on its lack of inclusion and equitability. After several years of unsuccessfully prototyping and proposing solutions to these issues I began to step back, unsure of how else to address the problems I saw. I justified my continued participation because I believed my role as a spokesperson for the organization’s reproductive rights campaign was important. TST was doing meaningful work to secure the right to accessible abortion and to challenge restrictive and unjust laws that hinder that access. My role as a visible female voice in the organization seemed vital — after all, on multiple occasions, leadership exclusively invited men to speak on women’s reproductive rights campaigns. A decision I strongly oppose. In February of 2018, the Temple asked me to step away from my role as a spokesperson due to the content of one of my personal performance pieces in which I called on people to sabotage and execute “the president”. The language I used was considered offensive by a few unnamed members in the Temple, and out of consideration for their discomfort, I stepped down. I stand by my words. The political and religious performance was centered around a criticism of oppressive power structures and an evocative call for self-liberation from these institutions. While my speech may have made some uncomfortable, the intention and meaning of the work was misinterpreted by people who were not in attendance. There was no effort to seek clarification regarding the context and meaning of the work. As many of you know, I’ve regularly employed bold language as part of my ritual practice as a response to a political environment that is similarly harsh. I intentionally did not name a particular individual because I take issue with the entire institution of power — and not those specifically within it. I chose specific language to broadly criticize tyrannical positions. Contrary to later interpretations, I did not name a specific person, or make a specific threat. Any interpretation or statement that colors my intention as calling for violence is inaccurate, out-of-context, and false. My departure was mutually agreed upon, but it was also business as usual — a small group of individuals with no accountability to the organization they represent asserting a paternalistic need to put a woman in her place, gain control, and undermine her autonomous power. I will not compromise the content of my creative work to satisfy the fears and complacency of others. The Satanic Temple that I joined years ago, when it was full of potential and courage, no longer exists and I cannot allow my voice, however controversial, to be silenced. I am writing this now because there have been a number of inexcusable actions on the part of the Temple that have compelled me to speak up. I was engaged with and promoted the work of TST for five years and now feel a personal and moral responsibility to make my opposition to certain actions public. If I’m honest, I must admit that I wish I had done so sooner. I recognize the kind of fear and intimidation that keeps us from speaking truth to power. I too struggle with this. Over the years, members and chapter heads have requested and proposed the implementation of a gender, sexual, and racial diversity policy to ensure equity within TST leadership and alignment to the mission. The demand was not simply ignored but completely dismissed. The demand was not hollow; there was a clear and pressing need for this policy. While I was part of the organization, I witnessed male members of the organization exploit their position and influence to behave inappropriately and disrespectfully towards women. I myself experienced harassment and abuse from members who have now left the organization. I was not supported by leadership during these times, but was asked to let it all “blow over.” I don’t speak for anyone but myself, but I know that my experience is one of many examples of systematic gaslighting, degradation, and bullying that many women have experienced within TST over the years. Despite being an organization that claims to be a champion for women’s rights, and despite relying on the work of many strong and talented women — most of whom are unpaid — TST has not created an inclusive space for marginalized members. Likewise, while they have a mission “against the exclusion of other voices,” there has been no effort to create a diverse membership or rid the organization of a culture of racism and sexism. TST continues this hypocritic legacy to this day. The Salem Gallery regularly hosts whitewashed panels and art exhibitions. While numerous women, queer people, and people of color have supported TST and have been members of TST, their voices and concerns have been willfully ignored and dismissed. This is a problem. A disinterest in including diverse voices and addressing racism, sexism and misogyny is completely inexcusable, but it is especially outrageous when the organization perpetuating gender and racial inequality benefits from and profits off of a marginalized narrative. Members of the public donate money to support TST’s campaigns in regards to women’s rights and religious liberty lawsuits and events. However, despite many requests from Temple chapters, the organization refuses to share how these donated funds are spent. Currently, there is no way of knowing if the money donated actually supports their legal actions. In fact, as far as I know, members do not know how they fund the products in their store, the gallery in Salem, or the many lawsuits they’ve taken on. Countless lawsuits have been announced or “planned,” many have not been followed through, and often times, the legal actions are strategically sloppy. Dozens of dedicated, supportive chapters across the country regularly commit their time and resources to raising money for the Temple. Yet members have no voice in how the money is spent, they do not decide how it’s allocated, and they do not know where it goes. Unlike other charitable groups, there is no public organizing board or regular financial disclosures and there’s zero oversight. Without a transparent process of accountability, TST co-founder Lucien Greaves has taken on absurd legal battles under the guise of the Temple. He recently sued Twitter over “religious discrimination,” upset that his personal account was briefly suspended and TST’s accounts have not been granted a “verified” status. The action on the part of the social media giant was perhaps unjustified, but asking thousands of members to support and donate money to assist in your personal crusade is corrupt and unhinged. Furthermore, using those funds to hire an attorney from the controversial Randazza Legal Group demonstrates a disgraceful lack of judgement that highlights the continued absence of diverse and equal representation within the organization. Are there no limits on this recklessness? Shamefully, I ignored past expressions of racism and sexism, believing that the cause we were working toward was more important than the errors of some. I was wrong. I bought into the same myths of white supremacy that feed our culture of racism and oppression and let myself support and help build a corrupt organization that further empowers privileged white men. My efforts toward reform were absorbed and subverted. I apologize for my part in this and know that white feminism has a long history of this same story. I am dedicated to deepening my understanding of intersectional feminism and committed to working within an antiracist framework. Judeo-Christian mythology reveals Satan as a catalyst who caused the explosion of knowledge and individual autonomy in humanity. Ultimately, Satanism is a philosophy that celebrates the individual and inspires a ceaseless pursuit of justice. And while TST claims to “adhere to the principles of individual sovereignty and rejection of tyrannical authority,” but their idea of individualism fails to respect the lived experiences, knowledge, and wisdom of people across all social identities. The organization lacks curiosity, perpetuates a narrow and limited understanding of reality, and maintains a bland and monolithic portrayal of the human experience that abandons the fundamental underpinnings of Satanic philosophy. Other chapters have struggled with TST’s abandonment of these core beliefs and have recently announced their own departure from the organization. It is not enough to declare one’s beliefs: a Satanic organization must also implement these guiding principles in practice. Many of us who have left believe that we must actively seek to include as many ways of knowing in order to strengthen our actions against unjust subjugation. Glorifying and upholding the limited understanding of reality that is available to cis/straight/white men is not just morally, ethically, and strategically wrong, it is antithetical to building community, uplifting the individual, and pursuing knowledge. The Temple is not an organization that I’m proud to be affiliated with any longer. In writing this, I have no ulterior agenda except to speak truth to my experiences. I wish to be open to those who have followed my work over the years and hope that they know that I did not intentionally mislead them. I remain incredibly proud of much of the work that I accomplished during my time at TST. Before I joined, you could count our membership on your fingers. Now, a movement has been built. I wish the story of The Satanic Temple did not land on such a cliché note. I ask that you keep the faith, for the corruption that you see now is not a symptom of radical organizing. Rather, it is a symptom of power, racism, and patriarchy. TST was nothing until the people on the ground breathed life into it. The people who showed up for actions, for protests, and at meetings, those who organized, who sacrificed their time and resources and supported one another. The Satanic Temple is all of you. In five short years, thousands of us have been able to take on state governments and legislators. We challenged reproductive injustice. We gathered en masse at courthouses, warehouses, and state capitals. We embraced our wild nature and our compassionate spirit. We are sinners, we are Satanists, and we are activists. If you leave TST, continue to organize and find ways of supporting one another. If you stick with them: demand inclusion, transparency, collaboration, and justice. After all, it’s you who have the power. As individuals and as a community we must continue to challenge the theocratic state and the injustices born from this imperfect world. I am deeply committed to this work and will continue to work towards liberation for all people. I’m with you, and I’m not going anywhere.